Exterior Cozy gas fireplace and the a comfiness of home. Exterior Open concept and high ceilings so everyone can be engaged Exterior View from sofa towards kitchen and open loft Exterior Beautiful stone fireplace and pine accents along with large picture windows embrace a feeling of comfort and relaxation. Exterior Dining area has dining table for 6 Exterior Breakfast bar with stools for up to 4 guests Exterior Fully equipped kitchen with all of the necessary amenities and room to prep and cook that family favorite. Exterior Stove, microwave and refrigerator with ice maker Dishwasher in kitchen Dishwasher in kitchen Exterior Space to prep and cook Exterior Main floor bedroom and bathroom entries Exterior Bedroom 1 main floor with queen bed Exterior Upstairs loft with private space to work, relax and read a book or take an afternoon snooze while enjoying the majestic views from the picture windows Exterior Bedroom 2 main floor with queen bed Exterior Upstairs open loft view Exterior Loft work space for those who just gotta work while on vacation...say it isn't so, but we know how that goes. Exterior Upstairs master bedroom with king bed Exterior Upstairs master bedroom with private shower Exterior Comfort inspired family room with TV/DVD and Cable Programming Exterior Grab a game or puzzle while visiting and make memories the old fashioned way Exterior Downstairs bedroom 1 with a full and single bed Exterior Downstairs full bathroom Exterior Downstairs bedroom 2 with queen bed Exterior Exterior Hot Tub under the stars Exterior Exterior Exterior Exterior Willkommen to Leavenworth! Exterior Selfie opp with our Village mascot Woody Goomsba Exterior Year round horse drawn carriage through the Village are a popular tourist “must do.” Exterior Enjoy the Art in the Park in downtown Leavenworth showcasing our local artists Exterior The Front Street Gazebo has local entertainment for your enjoyment Exterior Waterfront Park in downtown Leavenworth for walking, swimming, tubing, kayaking and more Exterior Beautiful Lake Wenatchee State Park for kayaking, canoeing, swimming, boating and fun in the sun Exterior Get your fish on. Head to the Cove at Fish Lake and rent a pontoon party barge or aluminum fishing boat for a reasonable hourly rate and get fishing. Exterior Sledding for the little ones on Front Street. 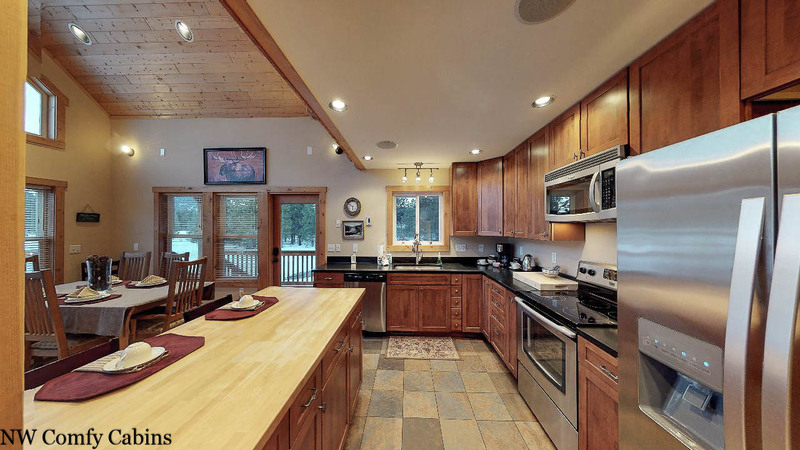 This beautiful home is situated on 2.5 acres in the quaint little town of Plain and is just 15 miles from the Bavarian Village of Leavenworth. You are also just a few short miles to the Mt. 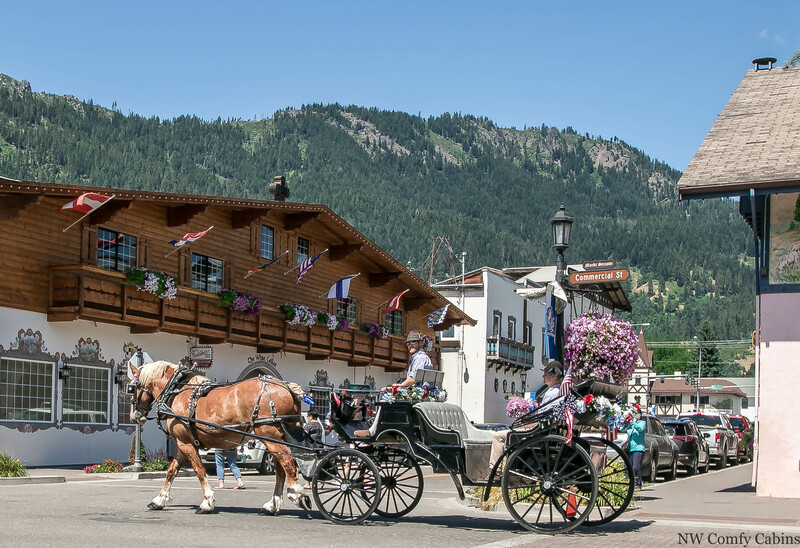 Springs Lodge and its many seasonal activities from snowmobile tours, Sunday Brunch, horse drawn sleigh rides, new Zip Lines and much, much, more. 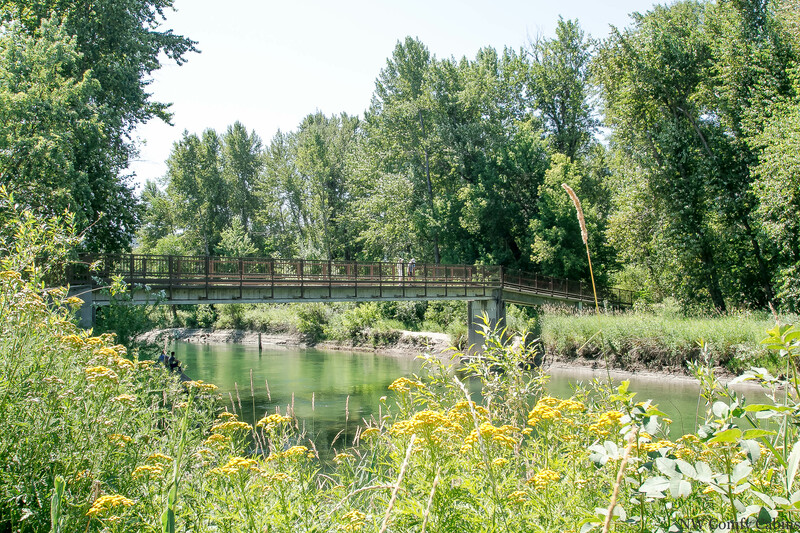 Summer months offer you an opportunity to enjoy the pristine Lake Wenatchee State Park, and the ever popular stocked Fish Lake's "The Cove" also just a few miles away. Boasting of territorial views both inside and outside of this home, the Peterson's Acres has 3 story's, with its 5 bedrooms, and 3 baths. 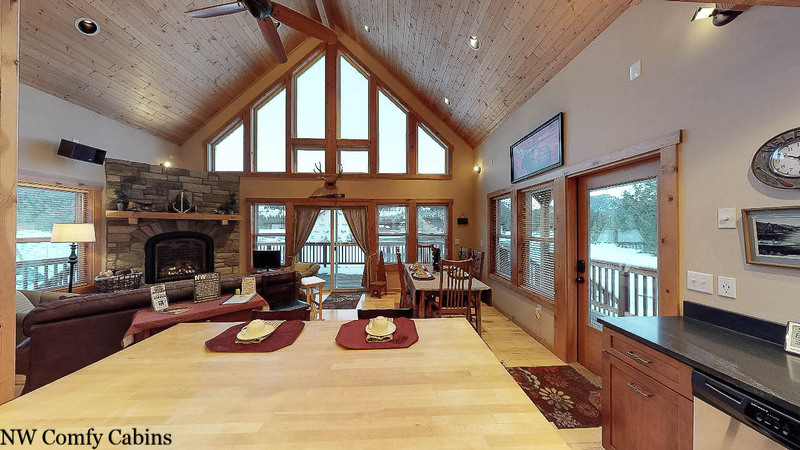 The main floor has an open concept kitchen/dining/living area for gathering round while enjoying a family meal, or a glass of wine in front of the cozy fireplace while watching the snow fall gently through the many woods wrapped picture windows. The kitchen also offers stainless steel appliances, radiant floor heating, an IPOD docking station, and breakfast bar with stools for up to 4 guests. The dining table nestled in the corner of the room seats 6 and rounds out your total dining space, for up to 10. 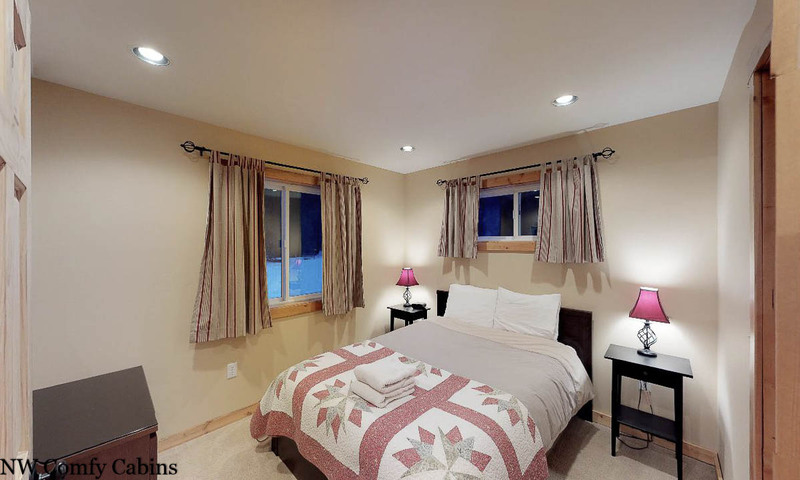 Privy to the main floor, you will also find a full bath, and two bedrooms, each with a queen bed. Upstairs, you are greeted by an open loft also boasting of view windows, a work desk, and WI-FI, along with your own master suite with king bed, and private bath with a gorgeous tiled shower. The lower level of the home offers the perfect gaming and TV area, with XBox, DirecTV, and an array of board games, books and cards, a full bath and two bedrooms, one with a full and twin size bed, and the other with a queen size bed. A W/D are also on site. 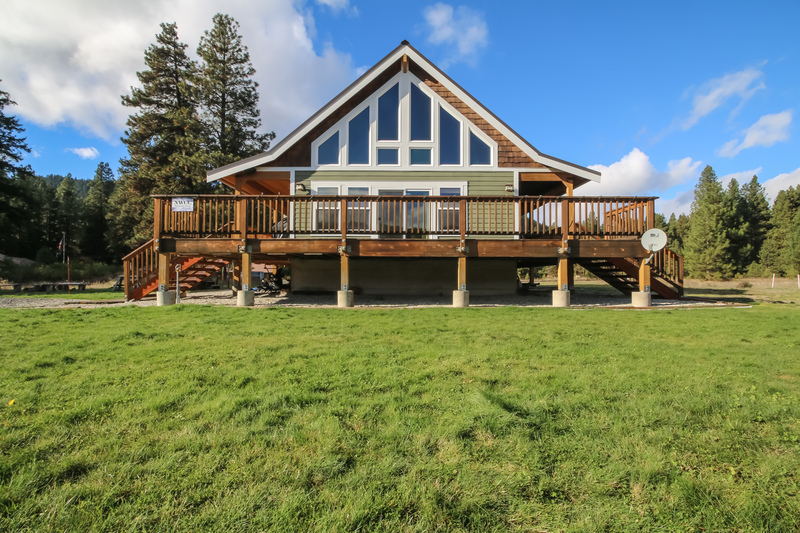 Rounding out your experience is the entertainment size deck, your own private hot tub, and those territorial views, all which make the "Peterson's Acres" the perfect setting for a family BBQ, small reunion, or gathering between old friends. Memories will be made here, you can count on it. This home requires 4WD, AWD or chains for winter access. This is a privately owned vacation home and we recognize that the home may sleep more than 11 people. The owners (based on fire marshal regulations, Chelan County rental regulations and out of respect to the communities we live and work in) allow a maximum of 11 guests under the rental contract. There are never to be more than 11 guests staying at the property during any rental contracted period of time. If more than the contracted number of guests are found on the property the contract will be null and void and guests will be required to vacate with no refund. Please understand and note that we are legally bound to adhere to our contracts with out owners and regulations. We respect and appreciate the efforts that allow us to offer vacation rentals for all to enjoy. The cabin was very clean and comfy. There were a total of 10 of us including 5 little ones. We didn’t feel over crowded and everyone had a room. The first morning our WiFi went out and the coffee maker was not working. I’m a big coffee drinker, I emailed and within 10 minutes, someone was at the cabin with a new coffee maker and she stayed til the WiFi was working! So pleased that you enjoyed your stay and felt comfortable and spacious. I am sorry that you had the issues with the coffee pot and the wifi, but so happy that getting things fixed quickly worked out for you, that is always our desire, to get things right when they fail, we try!!! Please be sure and come back some time, we have so many places to choose from and so many different options to enjoy when you have bigger or smaller groups. Nice! the only issue was a cold lower level. We are so happy to hear that you had a wonderful stay. We have looked into the temperature issues downstairs and found that the vents had been closed so the air was not being forced to the basement. So sorry that was an issue for you, luckily it was very easily remedied. Thank you again for your input. This is the second time we have stayed in this home for a family vacation. We had 11 people, including 4 kids under 5 yrs old, and this house had room for all of us. 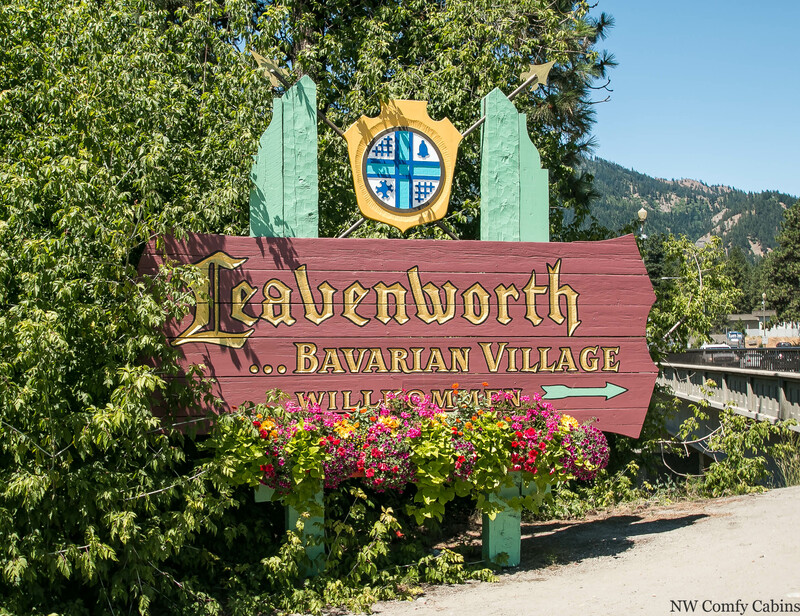 There is a great, flat yard for the kids to play, the neighborhood is quiet, and it is only 15 minutes into Leavenworth. The house was very clean and comfortable. We felt at home and there was enough room for us to get some space. Having 3 bathrooms was great! The downstairs family room meant the kids had an indoor place to play. We would definitely stay again. Thanks! We had a great time at the home. We had 9 people total there. Things you should know are that they charge by the number of people, so make sure you know your headcount and stick to it. Additionally, the photos are taken with a wide angle lens. The main living space area with the kitchen is smaller than it appears. That was quite the shocker. The AC was great int he master room and the basement. Thank you Brook for your comments. The lens of the camera is meant to be able to show the entire room. I think the best way to view a property is to see the interactive video. We do advertise and charge 'ala carte' so that smaller groups are not having to pay for the entire maximum guest count (the first 6 guests are covered and after that) then there is a fee for added guests. It is a 'meet in the middle' way to charge for the guests and an attempt to be as fair as possible. I hope that makes sense and thank you for being our guests. We rented this cabin for a little family get together. The kids loved the hot tub! We loved the view! It was very comfortable. The kids loved the basement area to play in and we loved that it gave us some peace and quiet upstairs! So awesome to hear! I really love the sheer rock face mountains that you can see from the cabin. It is a wonderful territorial view and so peaceful. We are pleased that you enjoyed it. 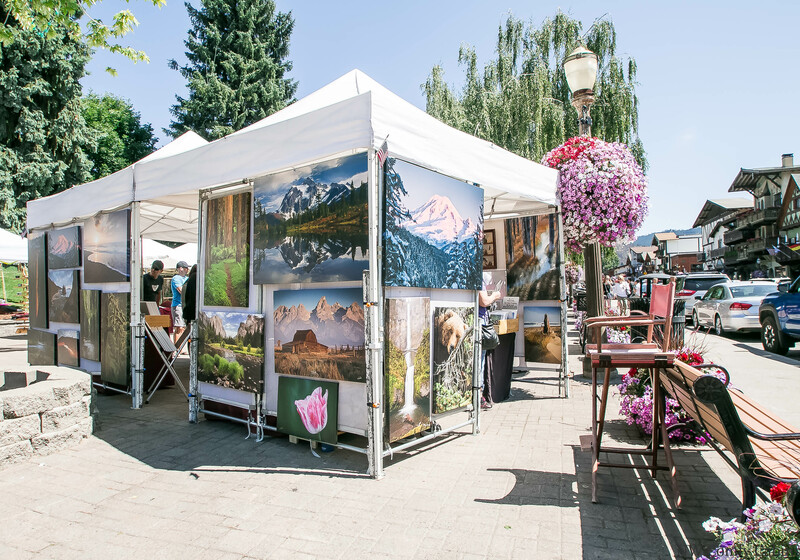 The location is fantastic - it's very, very close to Plain, near Lake Wenatchee and about 25 minutes from Leavenworth and 40ish from Stevens Pass. The home itself has a great location for a group and was very kid friendly (I have a 1 year old). The wrap-around deck was ideal for chasing the shade in the hot sun. Our dog loved the big open prairie yard. The kitchen was well-stocked and even had a waffle iron and food processor and a few spices/seasonings. The decor was tasteful. The main floor and loft/master bedroom were put together very nicely, though it seemed like some of the finishing work on the basement (trim, etc.) was still on the to do list. Overall, it was perfect for a group and we loved the property! Manager response on 2017-06-07 - Response from NW Comfy Cabins Inc. 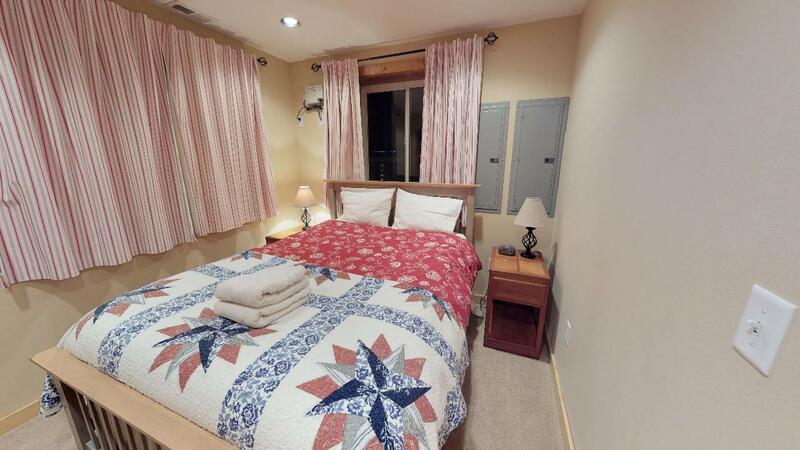 Very restful and peaceful cabin and location! A great quiet getaway from suburbia! Manager response on 2017-06-19 - Response from NW Comfy Cabins Inc.
Nice house, loved the hot tub! Manager response on 2017-10-10 - Response from NW Comfy Cabins Inc.
We stayed here for my 60th birthday. There were 8 adults and one 3 year old. It was the perfect place for us! Loved the layout and the open kitchen, dining room and living room. Enough parking for all 4 cars. The only thing of note is that there were no spices of any kind. Not even salt and pepper, so be sure to bring whatever you need for cooking. We loved this house and will return again! Spent the weekend here, was very happy with the home. Nice and quiet and tons of space. House was clean and had all the equipment needed to make our meals. Manager response on 2018-02-13 - Response from NW Comfy Cabins Inc.
Love to hear it, we are always inspired by our guests enjoying their time spent in our area. We hope that your vacation was one you will want to repeat and that you will choose us again next time. Thank you for your comments. We really loved our stay in this cabin. It’s big and spacious, comfortable, and has everything you need in a kitchen. The only thing i wished was a hot tub with a cover since it’s rained. Overall great experience. Manager response on 2018-02-07 - Response from NW Comfy Cabins Inc.
Great property. We had a great stay. House was clean, great shape and some amenities we never thought of (heated tile floors and speaker system was a major plus for sure). Beautiful view of the rolling hills. We had plenty of room to spread out, have our own spaces, yet all still be together comfortably in the common areas. Only down side - hot tub was not private...meaning, although no "near" neighbors, we still felt out in the open because there was no privacy walls or shelter for the hot tub, but because we were on vacation, it still didn't stop us from enjoying it. Manager response on 2018-01-25 - Response from NW Comfy Cabins Inc.
Glad to hear you enjoyed your stay, we hope to see you again. It is always interested to hear so many points of view on topics (such as the uncovered tubs vs covered ones) and we are always wondering about how to find ways to touch on all of those points of view and still stay true to an owners personal preference. Many people love the idea of the starry nights, and being in a warm hot tub with a light rain or snowfall happening, others feel the opposite. The good thing is that we do have many options and depending on the importance of a particular point of view, there are other properties to choose from to meet a certain need or requirement, if that would be meaningful to you. I am of the 'covered' thought process and my husband likes the 'uncovered' version, but I ask you, who do you think won that particular battle. LOL Happy tubbing and we hope to have you back again. We had a very nice family experience with three of our children and their spouses, including one grand daughter. We chose this property for its size, location in regards to entertainment and recreation and our good past experiences with the Comfy Cabin folks. With the hot weather, the indoor air conditioning was such a comfort to retreat to after spending time out of doors. We also enjoyed using the hot tub to soothe our aches and relax in. We found the kitchen to be ample for our extended family and differing needs and found all the utensils, pots and pans, dishes and cleaning supplies that were necessary. We also made daily use of the propane grill out on the porch. We all love to grill. Having a group the size of ours, it was nice to have three bathrooms available in the evening and especially in the morning when getting up to start the day. We would certainly recommend this property to friends. Thanks for a nice stay in a great place. We loved staying at Peterson's Acres with our big family! Great sleeping arrangements and places to hang out. The house was very nicely decorated and very functional. Has a well equipped kitchen. The hot tub was fun and it was great to have a nice yard and swing set for the kids. Thank you for the great stay! We selected this property due to its size and location. Fish Lake is a short drive away. The property was is in good shape. A few odd things with the stove. The fry pans are in rough shape. overall a good property to stay at. An old group of friends used Peterson's Acres for an annual getaway and catch-up. Lots of space in this house - 5 guys who snore loudly and everyone slept soundly. Everything you need to prepare and serve meals for a group. One disappointment - the horseshoe pits had been removed. The management was extremely responsive and generous in their suggestions for alternative entertainment. Manager response on 2016-03-06 - Response from NW Comfy Cabins Inc.
We are glad you enjoyed your stay! We enjoyed our stay but disappointed the hot tube was not working. We found out about the hot tub problem two days before our departure, so there was no time to make a change. 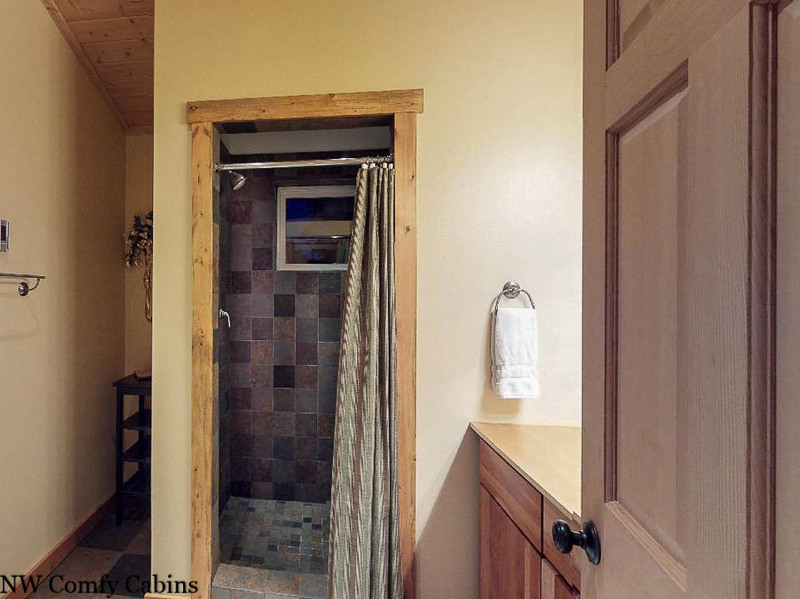 Comfy Cabins plans to refund 10 percent of our fee for this reason, and we agree this is fair, The hot tub was a primary consideration when selecting the place. Also, the TV was not working. It appears a cable was missing along with an Xbox. We didn't miss using the Xbox, but would have like some TV. Wi-Fi was also not working but we were able to resolve during the first evening with the owners help. The house was very clean, comfortable, plenty of room, nice porch with plenty of outside chairs. We especially enjoyed the night star gazing. The young ones enjoyed the swing set and had fun playing in the front yard. I would also like to note that there are multiple check out instructions, and each one is somewhat different, causing a little confusion. One was posted on the refrigerator, one in the "guest book", and another which was emailed to us. Overall, we had a very good time, and would come back again. It was excellent! Great for our grandchildren ages 1, 2, 3, and 6, with swing set, slide, and large grassy area, plus a school playground just around the corner. 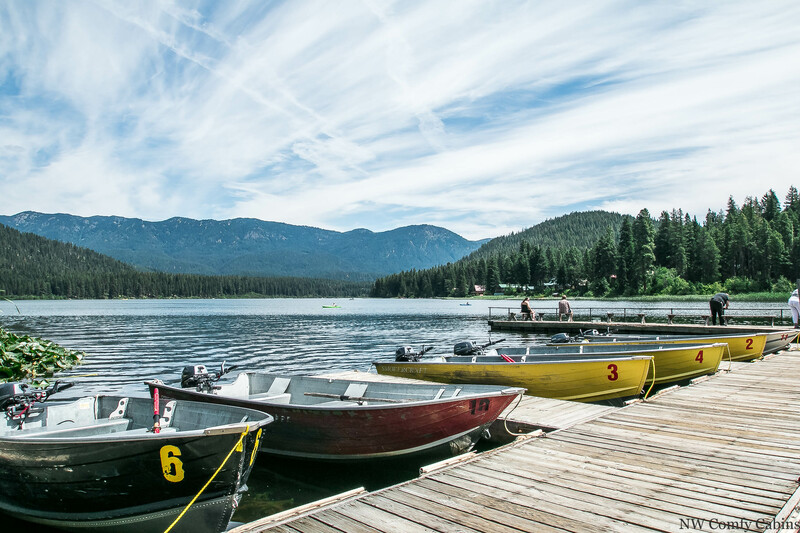 Lake Wenatchee State Park with rental paddle boards is just 5 miles away. Very nice, as always. Took advantage of the good weather to do some walking about. The cabin was wonderfully located and beautifully set within the hills. The inside was gorgeous and very clean. We all were very comfortable and had an amazing time. We definitely will be coming back for another visit! 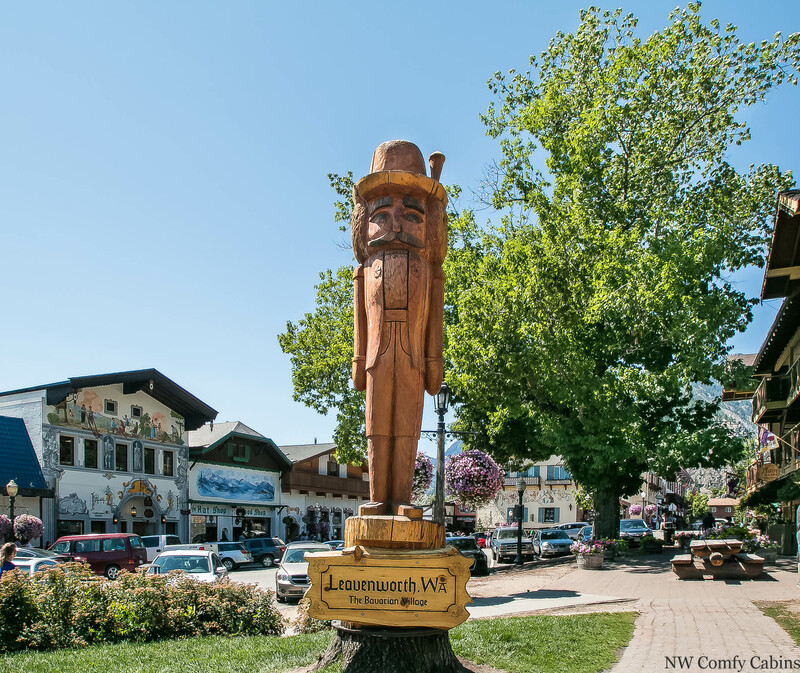 Thank you for a wonderful stay in Leavenworth this fall! Our group had a lovely time at Peterson's Acres. The space was big enough for all four couples, but also cozy enough that it was easy to hang out together as a group. Everything was well maintained and very clean! We didn't have any issues, but NW Cozy Cabins checked in and let it be known they were available to help, if needed. The only suggestion I have is that information specific to the unit (check out procedures, how to use speaker system, etc.) 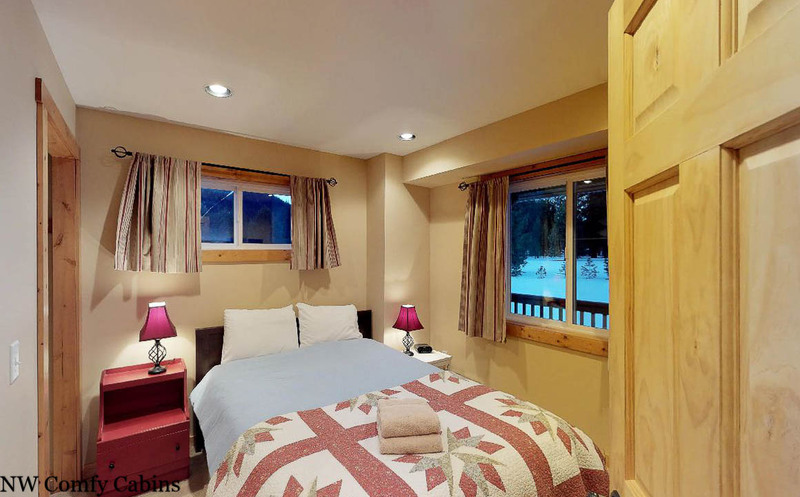 be included in the packet that NW Cozy Cabins provides. Thanks! Loved this house! Large,clean,beautiful! Accommodated our group of 8 adults, 1 teen, an infant and 2 toddlers very well. Hill in the yard for sledding so we never had to leave! We would definitely stay here again. Only recommendation would be to provide baby gates that fit the stairs, two were at the house but they were only long enough for the top of the stairwell going down stairs from the main floor. 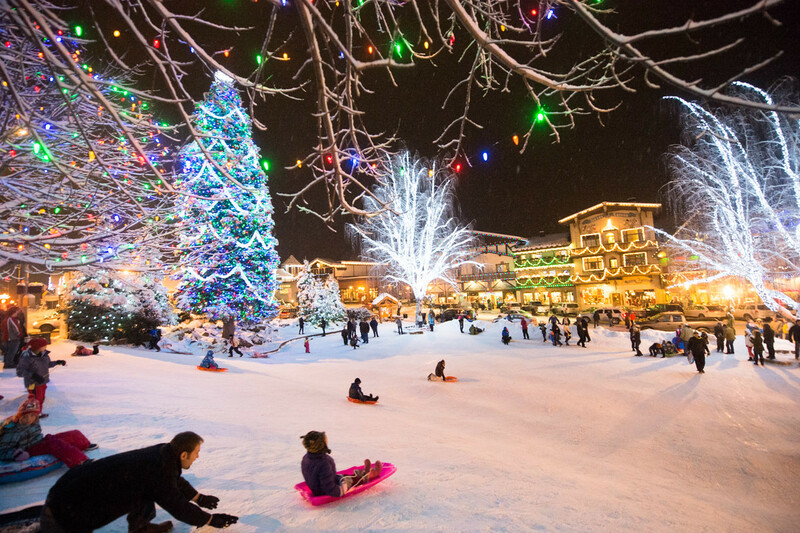 Manager response on 2016-12-14 - Response from NW Comfy Cabins Inc.
Our family loved our vacation in Plain during December. The Comfy Cabin rental was a perfect fit for our group! Our threee grandsons aged 1-5 were thrilled with the train table stocked with all the cars in the comfortable family room downstairs. They also used the small kid table upstairs as a little craft station. Outside a swingset and just perfect sized hill afforded hours of snow play. The charming home is set in a scenic and quiet meadow just West of Plain where we rented our cross country skiis and snow shoes. My husband and I relished the privacy of the Master suite located up in a charming loft. The Master bath contained a large tiled two person shower. The cabin was nicely decked for the Holidays with a fully lit and decorated tee in the open area upstairs. We used the dryer downstairs to fluff ou our snow clothing. the main floor living area was nicley arranged with just enough area to move around while retaining a cozy feel. The stone fire place with gas insert keept us toasty warm. Thank You, Comfy Cabins for a wonderful winter get-a-way! 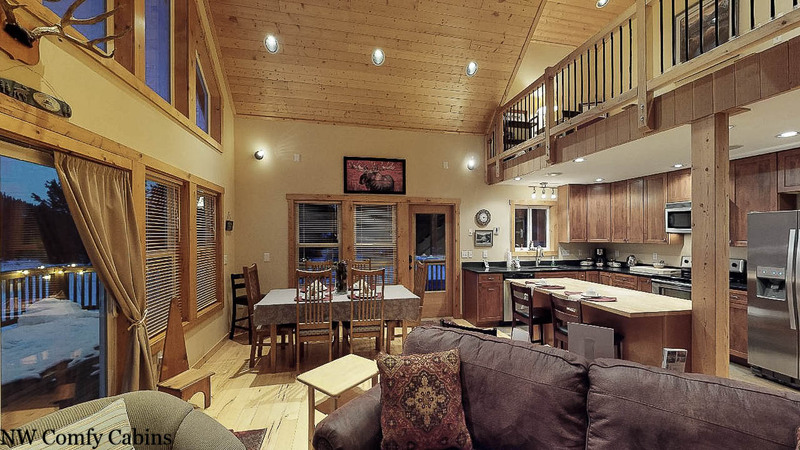 Very nice cabin to spend good time with family and friends. Manager response on 2016-11-01 - Response from NW Comfy Cabins Inc. The cabin was very nice. The reason I won't book this cabin again is the sulfur in the water and not having a TV in the main room. The pictures were a little deceptive. I was expecting a larger house. I did get a little confused with having to turn on the water and we did lose power and have to flip a switch. But we all thought the house was beautiful and comfortable! We loved our stay but the water is not treated so it was pretty dissatisfying but we were thankful to all have hot water! We would reccommend this place though. A lovely place. Appears recently built and designed for guests. Plenty of space and everything we needed. Each year, my wife an I rent a cabin in the area for a group of friends to attend Oktoberfest in Leavenworth. This cabin is a short drive from the general stores in Plain if you realize you forgot something. The house was a good size for a group, and we all enjoyed ourselves. We typically find a new house each year, but I wouldn't be surprised if we ended up back here. We did find that the water was shut off when we arrived and there were no instructions for turning it on, however we figured this out on our own. There is some minor updating occurring at the cabin--missing baseboards--but this did not detract from the experience. We maxed the place out at the guest limit of 11, but there seems to be room for up to 4 more, if you were to bring your own air mattresses, or didn't mind sleeping on the floor. I stayed at this location with about 8 people. Overall, we had a great time. I had the luxury of sleeping in the large bedroom upstairs - spectacular. The fireplace was great for ambiance, the views were amazing, and the kitchen was plenty big to accommodate a lot of cooking. The house was spotless too, which is always nice. We had a great time the only negative was the dishwasher was broken. All in all the place was great despite some dishpan hands. We were so impressed with the man who came out and plowed the road and driveway for us. It was a very nice surprise! We rented the cabin for a girls' ski weekend. Great location - only 30 min to Steven's Pass. Super clean house, I'd never seen an oven and fridge as clean as these - you would have thought they were brand new. The weather forecast was iffy and the rental company gave us a heads up and even offered to let us rebook. Thankfully the weather behaved itself and we had an amazing weekend. We're now trying to find another weekend we're all free to we can rent again. Highly recommend! This was a great home to gather with my brother and sisters and niece. We are from all over and wanted a place to stay together near a wedding that we attendend on the 6-21-14. It wa a good time. It was a wonderful Thanksgiving for out family in this home. We all loved it, and will rent again. The house was hard to find, and we had to call for help. Thank you for getting us there!!! Most everything was perfect, except the TV in the living room was too small. Place was great for our group in Plain for my sons wedding. Plenty of room and space for all. Only bummer was washer wasn't working so towels ran a little short. Only suggestion on amenities would be having a couple of large fry pan for cooking breakfast. We overcame and enjoyed our stay very much! Would recommend the place and stay again. Found the vacation home to be not as described. Know this - basement level is not completely finished. Trim work not done and has holes in drywall. Hot tub does not work. Views are of an old beat up trailer. Manager response on 2014-08-06 - Response from NW Comfy Cabins Inc. 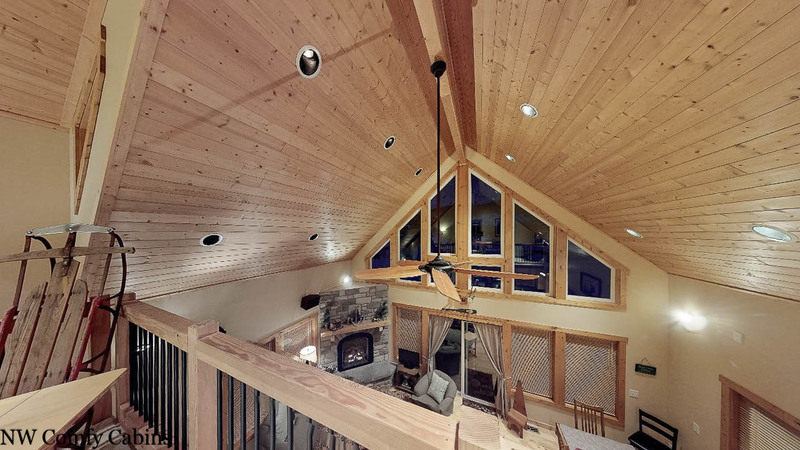 This cabin is gorgeous, clean, and in a great location. We will be back for sure and hopefully stay more than 2 nights! This is our second year staying at this house and it is amazing every time. For the first time it snowed and it looked amazing outside. Great space for our family and the heated floors are amazing. My wife and I and both our parents enjoyed this cabin as it was spacious enough for all 3 of us (as couples) to have our own floor and bathroom where we could have quiet time of our own as well as come together for meals , games, etc. 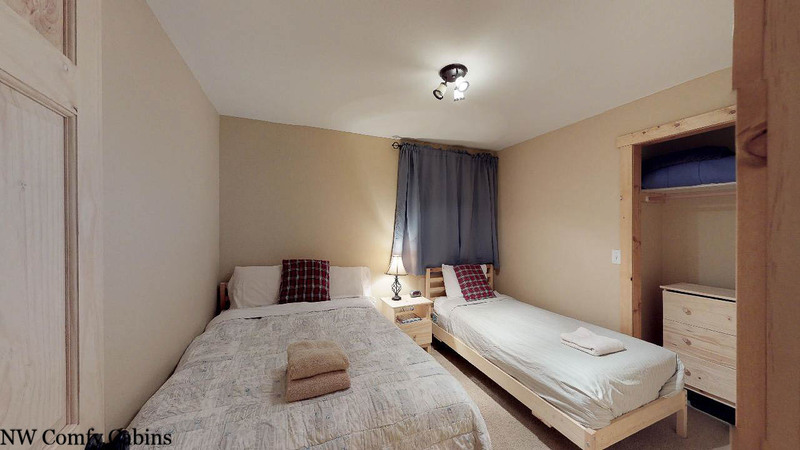 With so much space and so many bedrooms, it's the perfect cabin for multiple couples, groups of friends, or even a couple families with children. We had a wonderful time at the Peterson Acres Cabin. 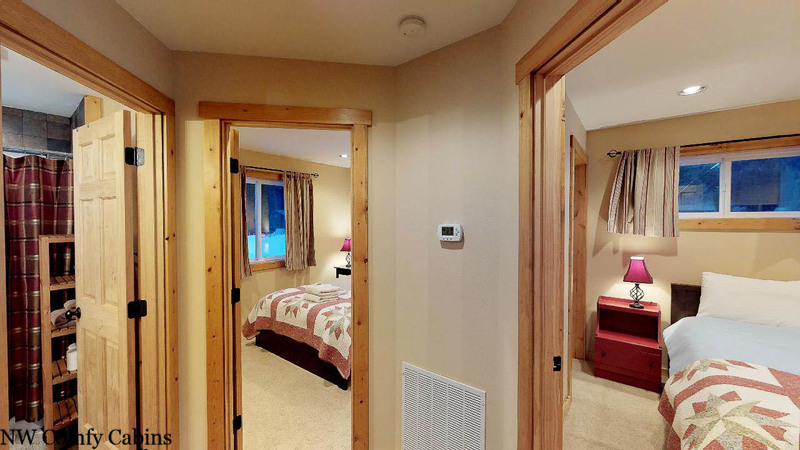 The home was very well equipped, plenty of room for 3 couples and the Heated Floors were amazing! We were pleansantly surprised by the size of the Hottub, all the gadgets and utensils available to us in the Kitchen, and the views from this home were great. I would rent here again! Manager response on 2015-01-19 - Response from NW Comfy Cabins Inc.
Aaron, thank you so much for sharing your experience with us! We love hearing that you guys had a great time! Can't wait to have you back. The McLaren family loved Plain, WA and the Peterson Acres!! We had a wonderful family vacation at the Peterson Acres last week. Our kids and grandkids loved the Plain area and we look forward to returning again. We would recommend this house to our friends!! 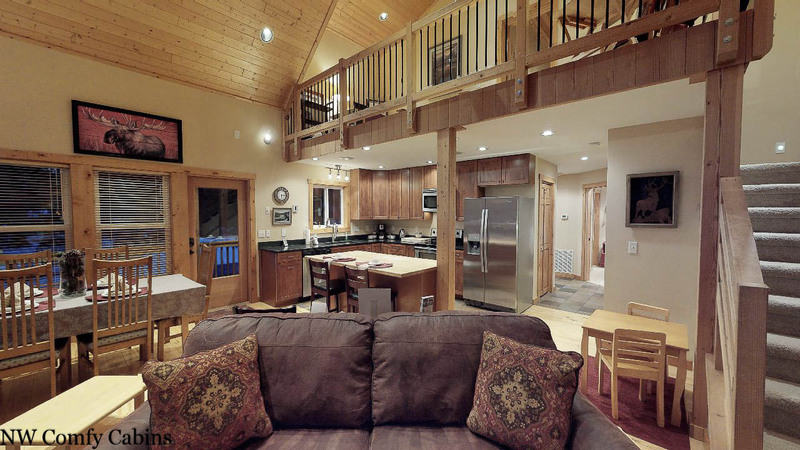 Awesome cabin to spend a little getaway with friends! 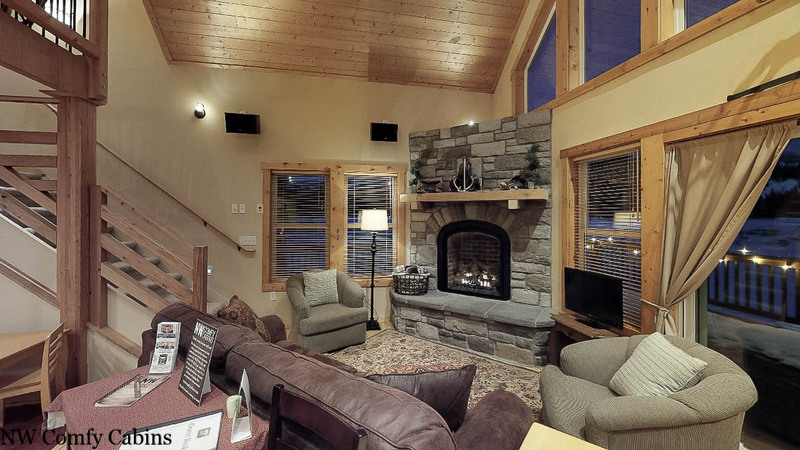 Every winter we rent a cabin for a weekend in the Wenatchee/Leavenworth area and this cabin fit us perfectly! There was so much room for us and the kitchen was nice and open so we could all be together. Has a nice cozy fireplace, and has heated floors!! We were obsessed with the heated floors! The only bummer was it didn't have any tree coverage or on the water. It's a big open space, very exposed. Not a big deal but something to mention. There are beautiful views though. All in all, we loved our stay! One for the books! Manager response on 2015-03-12 - Response from NW Comfy Cabins Inc. The house was lovely, everything was in good working order. The management was prompt with communication and made sure we had a great time. The house could have used a slightly better dish brush and there were no advertised horseshoes...but those are really silly minor complaints. Overall it was a FANTASTIC stay. Came here with my family, and we loved it. It was a very nice place, very relaxing. I would definitely think about coming back. The six of us, all adults, had a great time. This is the second time we have rented the place. That it is near Fish Lake is a plus. Our group of 3 families goes on a trip every year. This year we chose Peterson Acres and were not disappointed. It was so comfortable and relaxing. Our kids enjoyed the playset outside along with the gigantic dirt hill where they spent most of their days. We also took a trip to the school playground for extra play. There is plenty of room for everyone. Thanks for another great year. The only downfall was the hot tub not fully working properly (lack of bubbles :). The house was very nice. Big enough that we all had our own space, but we gathered in the main living area most of the time. The large deck and yard was fabulous. The house was well stocked with all the necessary items. Manager response on 2015-07-15 - Response from NW Comfy Cabins Inc. It was a great place to stay! Beautiful home and views. The only thing I will say is that inside, there seemed to be a fly infestation. There were probably 50 flies in the living area that were rather bothersome, along with a pretty significant bee problem outside. There are several bee nests under the eaves of the house, we could not eat outside at all. Other than that, we loved it!